Six ways to show you care in the most scrumptious possible style. Our giant California strawberries are lavishly hand-dipped in premium dark chocolate, rich milk chocolate and cupid pink white chocolate in our own kitchen, then decorated with extra tlc and presented with a passion for perfection. All of our chocolate covered strawberries are beautifully packed in our signature gift box with ice packs, then shipped overnight to ensure perfect arrival. 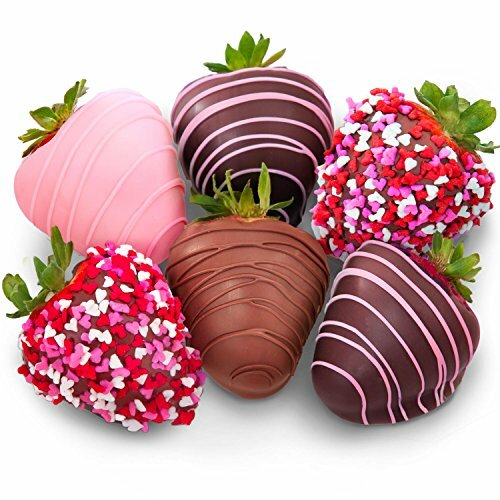 A sweet way to send your love! 6 delicious strawberries dipped in real chocolate - rich pure dark chocolate, rich milk chocolate and pink-tinted white chocolate, and decorated with drizzle and sprinkles.